We probably should have named her Francis or Francine. Shortcake is the Animal Whisperer in our house and she loves this feast day! Since St. Francis is the patron saint of animals (which always makes me smile when I see him standing in someone's garden as most gardeners seem to want to keep the critters out. Just ask Mr. McGregor!) we usually find his feast day to be a good day to have fun with our furry friends. Today we made masks! 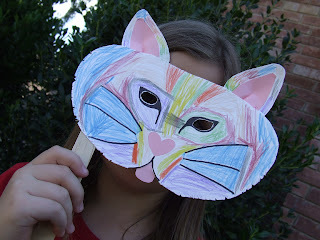 Sunshine's is a masquerade type cat mask that she colored with her own special flair. BigBoy's was found on this website and printed on card stock. I think this lion's shaggy mane needs a haircut! 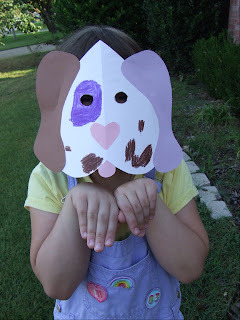 Shortcake's puppy was inspired by the one we found here only made with her favorite colors, brown and purple, and tied on instead of held. We thought about trying to make it to the zoo today but aren't sure if the weather will cooperate. We might have to stay in and watch a movie instead. I hope your weather is cooperating with any plans you might have today! 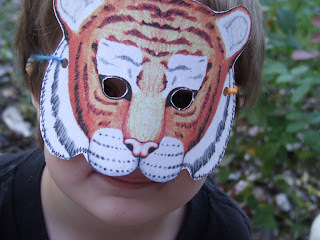 Oh I love the mask-making idea! They look great! Ooooh! 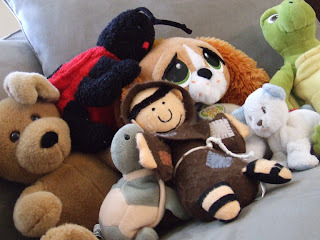 I love the little St Francis doll! Where ever did you get that!?! PS I have deleted my blog (for a variety of reasons)but will continue to visit you and hope we can still be friends!